The process of selling a home is complex. There are a lot of parties involved. Including the buyer, the buyer’s real estate agent, lenders, an escrow company, a title company, and sometimes a real estate attorney. Accepting a cash offer simplifies things a bit. There are fewer parties involved. The deals fall through at much lower rates. So what’s the process of selling a home for cash look like? What is an all-cash offer? The phrase “all-cash offer” is actually a misnomer. Did you know it’s illegal in the U.S. to close a real estate deal with actual cash? Instead, an all-cash deal is when someone buys a house outright, without financing. To close, they transfer the funds electronically or with a cashier’s check. All-cash offers typically come from two types of buyers. Individual buyers (who plan to live in the home themselves) purchasing without the help of a bank. Real estate investors, who can also be called iBuyers. An iBuyer, such as Breyer Home Buyers, will review basic details about your home, send you an offer. If you accept, you can close quickly, without ever actually having to list your home. What is the standard real estate closing timeline? Because a lender isn’t involved, the closing time for cash purchases can be shorter. Once you’re under contract, a cash sale can close in as few as two weeks. This is just enough time for the title and escrow companies to clear any liens, provide insurance, and get paperwork ready. The typical closing time for a financed purchase (one where the buyer is taking out a mortgage on the home they’re buying) is at least 30 days. This is usually chosen to align with relocation plans or another real estate purchase. 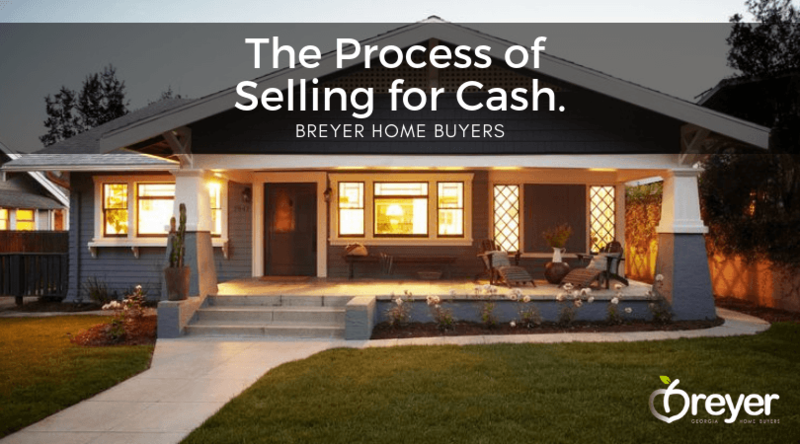 What is the Process of Selling a Home For Cash? At Breyer Home Buyers, we have a handful of reputable real estate attorneys who handle closings for us. These attorneys have numerous locations for your convenience. A title company is responsible for making sure the property lines are drawn correctly and that there are no property liens that need to be addressed. They issue the title insurance and, on closing day, ensuring that the actual property ownership changes hands. The escrow company is responsible for managing all closing documents, facilitating the transfer of funds, and completing the legal paperwork that records the sale. Note that our real estate attorneys handle both the title and escrow tasks. What is a property lien? A property lien is a legal notice related to an unpaid debt. If you’ve failed to pay your taxes, child support, the settlement for a court case against you, or a contractor who has done work for you, a lien can be placed on your home until you settle the debt. Long story short: You can’t sell your home until all liens are cleared, and it’s the title company’s job to make sure there are no outstanding liens before closing. It’s common for buyers to submit their offer with an inspection contingency. This is an addendum that states that they will pay to have an inspection done, but they have the option to request repairs or renegotiate the agreed-upon sale price based on findings. At Breyer Home Buyers, we perform our own inspection with our contractors and partners. We after we walk the property at our appointment at the home, we note all of the repairs we believe we need to make. These repair costs are accounted for in our offer. We could have to renegotiate based on unknown repairs that need to be made, such as a cracked foundation or rotting roof trusses we didn’t see. Get your signing hand ready. It’s closing time, and a mountain of paperwork is pretty much a guarantee, even when dealing in cash. Final closing instructions: Closing instructions are sometimes signed when your escrow account is first opened, but if you haven’t signed them yet, you’ll do it now. It’s basically a detailed outline of the tasks your escrow company is responsible for, and the process they’ll follow to complete your closing. Make sure to double-check all amounts. HUD-1 settlement statement: Required by federal law, the HUD-1 is a detailed accounting of all money involved in the deal. It includes everything you will have negotiated up to this point, and more: sales price, payoff balances, pro-rated tax and utility bills, and more. You’ll want to keep this form for your taxes. Make sure to have your closing agent go through line by line before you sign so you can check for errors. Certificate of title: In this document, you sign to swear you have the right to sell the property. Title deed: The deed is the piece of paper that actually transfers ownership to the new owner. You’ll sign it at your closing, but your transaction will actually be considered closed when it’s recorded at the county courthouse. Loan payoff statement: If you have a mortgage on the property you’re selling, this document shows how much you owe to your lender as of closing day, which should match the amount the escrow company is going to pay off on your behalf. Mechanics liens: On this document, you swear that there are no additional liens on your property from contractors or laborers. Bill of sale: If you and the buyer have negotiated any additional items into the deal —say, you’re leaving the backyard swing set or some specific furniture — these items will be outlined here. Statement of closing costs: By signing this document, you state you were told about all closing costs and other fees ahead of time. Statement of information: Simply put, you swear that you are who you say you are. What is needed to close a cash real estate deal? The deed, if your home is paid off. House keys, garage door remotes, and codes to keyless entry and alarm systems. A certified or cashier’s check to cover any outstanding costs that won’t be covered by your proceeds, like lien payments, property taxes, or prorated utilities. Your escrow company should let you know ahead of time if you’ll need to bring additional funds.